The Galway Tent Blog: I See Nothing, Nothing! Public Consultation Sessions and The Big Lie. OUTLAW TERRITORY NOW INSIDE DDDA's EMPIRE. At the cynically titled DDDA public consultation sessions in June 2008, the DDDA person titled as senior project manager was backed up by two expensive consultants. 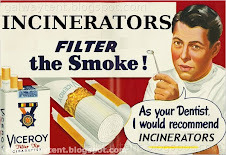 One of the consultants isfrom the organisation promoting the waste-to-toxins incinerator. 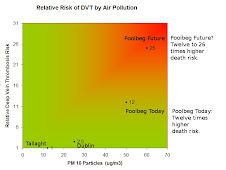 The other consultant seems to know as little about air quality as DCC's expert (but probably does not do sums with percentages to claim the air is safe). 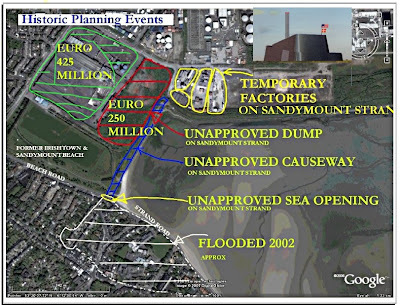 How private companies now own large sections of Sandymount Strand (Fabrizia Site, IGB Site). Poisons currently leaking onto Sandymount Strand from the Dump (Sean Moore Park) The DCC-DDDA reps claimed Sean Moore Park could be dug up and processed through the proposed incinerator. The perversity where DDDA, a Docklands entity, controls a public park (Sean Moore Park) but the same Docklands entity does not control any of the actual docklands, vast areas on both sides of the Liffey. The conflict of interest wherein DDDA owns equity in the IGB site and also controls the planning permits for the IGB site. The complete lack of maps of DDDA's territory and its schemes, apparently, other than a Big Lie photograph. Claims the DDDA website is up-to-date and is Meaningful Information. The public information sessions were not advertised on the DDDA website. Or maybe the sessions are buried in some obscure place in a white font (Seil Gib?? Accuracy in Depth?). Why strongly imply an Environmental Impact study by advertising the consultant in an expensive taxpayer funded brochure when the study "has not yet" been done (another Big Lie Technique) ? Why advertise and imply an Economics Study by a Property-Industry company, and claim the Property-Industry has no conflict of interest? Why there are no economics scenarios for public discourse? Apart from the moronic word 'growth' in the first paragraph which they could not explain? Why apparently spin that DDDA could use business scenarios done by someone else when DDDA is now actively propositioning to use up €5 billion of taxpayer money? Why was the notice of the alleged statutory public consultation published in a newspaper on a Bank Holiday weekend. And not on the DDDA website. And why there was no mail-shot to local houses (Big Lie Technique)? Why would building developers erect thousands of luxury rabbit-hutch flats on a toxic dump beside the incinerator, a huge poisons emitter? Apparently Big Money building developers did not appear at the Bord Pleanala or EPA Incinerator hearings. Will building developers use these poisoned sites as a trade-off for their social housing commitments, despite the apparent fact that people living beside Sean Moore Road, built on the dump, have compromised health? Apparently the DDDA employee titled as 'senior project manager' had no in-depth business information on the DDDA, on the DDDA board members, on who appointed them, nor on their business interests. But there was a response from the DDDA-DCC team where they wondered if Leaving Cert results for DDDA Board should be published. Feldwebel (Sergeant) Hans Schultz, serial number 23781 (John Banner) is Klink’s bumbling, highly unmilitary sergeant of the guard. Schultz is a basically good-hearted man who, when confronted by evidence of the prisoners' covert activities, will simply look the other way, repeating “I hear nothing, I see nothing, I know nothing!” (or, more commonly as the series went on, simply “I see nothing, nothing!”) in order to avoid becoming involved in any way. Homer Asks: Is there a brass statue to a Taoiseach in Dingle, accurately portraying his brass neck and including the DCC-DDDA tattoo?